Articular cartilage degeneration, for example, resulting from joint injury and trauma, has remained a major clinical challenge as cartilage does not have self-healing capability, and osteoarthritis (OA) often ensues. OA affects over 15% of the population, including 65% of those above 65 years of age, and is a major cause of physical disabilities. There is thus a need to develop treatment strategies that can effectively target prevention and/or blockage of early stage disease progress, rather than prosthetic replacement of the joint at the end stage. This chapter provides an overview of the state of the art and future prospectives of cartilage repair strategies. The clinical relevance and tissue pathology of cartilage injury are first introduced, covering the structure and function of cartilage tissue and evaluation and clinical management of cartilage injuries. Next, the principles and strategies of currently practiced cartilage repair are summarized, including palliative approaches (e.g., arthroscopic debridement/lavage), intrinsic repair (e.g., bone marrow stimulation technique—abrasion, drilling, and microfracture), whole tissue transplantation (e.g., osteochondral graft transplantation), and tissue engineering strategy (e.g., autologous chondrocyte implantation/transplantation). An overview of recent advances in cartilage repair strategies is presented, particularly the progress made in stem cell-based therapies and biomaterial scaffold designs. 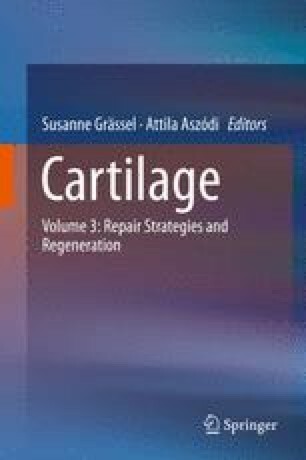 The chapter concludes with a discussion of the remaining scientific and clinical challenges in cartilage repair, specifically highlighting the need of enhancement of tissue integration, maintenance of cell phenotype, prevention of OA progress, and simplification of surgical and rehabilitation procedures. The authors thank the International Cartilage Repair Society (ICRS) for their kind approval of using illustrations from the ICRS Cartilage Injury Evaluation Package (Fig. 1.4). Research funding is supported by the US Department of Defense (W81XWH-14-2-0003, W81XWH-14-1-0217), NIH (R01 EB019430, P30 AG024827), and the Arthur J. Rooney, Sr. Endowment.